BY THE SEA is a mystical romance film with a touch of comedy. The feature film was written by Dean Huh and Dean Barnes, also the executive producers. The film follows Lena Oscar, a New York pastry chef who ends up working at a summer resort after having vivid dreams that lead her there. Tony Bennis was producer/publicist. The film was directed by Dean Barnes. BY THE SEA earned dozens of awards - including a nomination as Best Film of the year from the Imagen Awards - the Latin American Oscars. JAHMOL’S VISION FOR YOUTH PEACE is a Synergy Media Partners film, produced and directed by Tony Bennis. Mike King is the director of photography. Music by Deric Quest. BY THE SEA was filmed on location in southern Rhode Island, New York City, and Los Angeles. The film received top awards in dozens of film festivals in the United States and in foreign competition. Elena Aaron was nominated for a Best Actress award and Chris Rivaro was nominated Best Supporting Actor in the Imagen Awards (the Latin American Oscars). See trailer above. 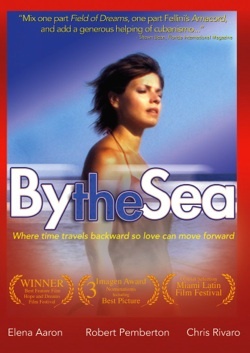 Elena Aaron and Robert Pemberton star in the mystical romance film, BY THE SEA.